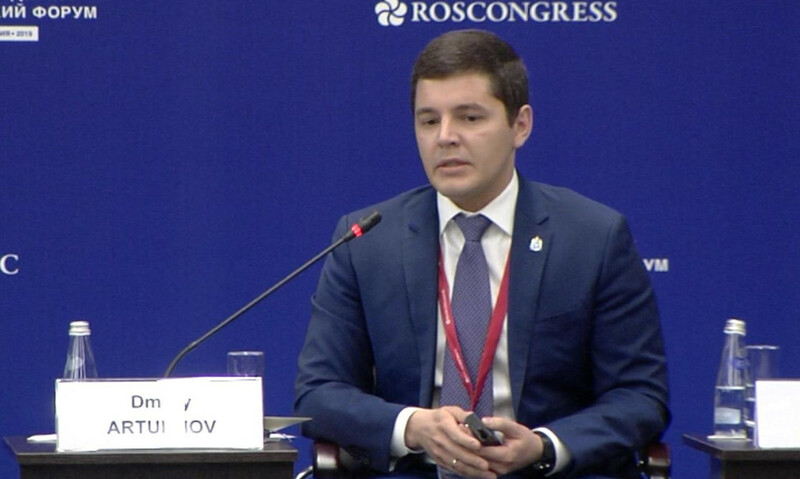 At the international forum “Arctic — Territory of Dialogue”, where the future of northern regions of the world is being discussed, Dmitry Artyukhov answers the question whether LNG projects can be drivers of not only economic but also social development. To demonstrate that industrial development entails social development, he showed colorful illustrations of objects built in remote settlements of Yamal. It is doubly valuable that these objects were built at the expense of users of subsoil. Dmitry Artyukhov drew attention of the audience to a point on the map — the settlement Gyda. “It is a very remote settlement; it takes six hours by helicopter to reach it. And there was nothing there. There were very bad conditions, an old, dilapidated settlement. But last September we opened the doors of a wonderful school”, the governor reminded. He notes that children, who are depicted in the photo, may have other different life due to the fact that they will go to a comfortable, most modern school since their childhood. Then staying on the edge of the earth will not seem so burdensome. “This school appeared thanks to the company “NOVATEK”, which supported us. Personally, Leonid Viktorovich Mikhelson, who, in fact, has already become a citizen of Yamal, cares about the region”, the head of the region said. As he notes, schools, kindergartens, many sports objects appear in Yamal everywhere with help of oil and gas workers.